The Bay of Islands area of the North Island of New Zealand has some of the most beautiful scenery I have seen anywhere in the world. It is really spectacular, with mirror seas backed by rocky and green islands and land. The Bay of Islands area is about three hours (240 kilometres) north of Auckland. 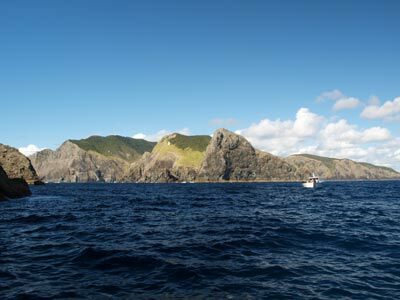 The mainland north-eastern section of the Bay of Islands has as its major feature Cape Brett. This was named in 1769 by Lieutenant James Cook after Sir Piercy Brett, one of the Lords of the Admiralty. There is a lighthouse here (you can walk to it, eight hours from the nearest road) and it overlooks Piercy Island. It is said that Cook called the island after Brett due to the remarkable natural feature he saw. The south-western part of the island has a huge hole right through it (hence Cook's play on Brett's first name - piercy). 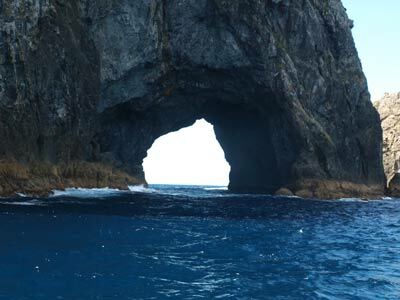 This is now called "The Hole in the Rock" and is the iconic feature of the Bay of Islands whenever you see it advertised or shown on television. This hole is so large enven the really big tourist cruise boats fromRussell go through it when conditions permit. 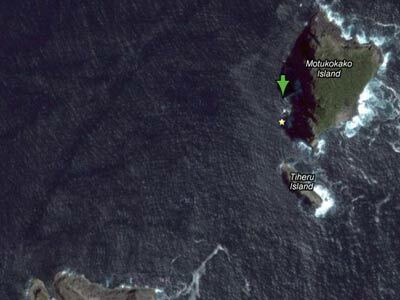 The island is called Motukokako Island by the Maori. From the boat ramp at Te Uenga it is about 25 minutes in a very fast boat (say 30 or more for most) to this location. 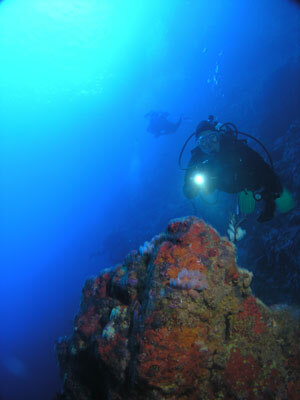 There are a number of excellent dive sites here, probably more than those that are regularly dived by the local dive operations. Just to the north of The Hole in the Rock is Cathedral Cave. GPS S35º 09' 59.0" W174º 20' 39.9" will put you out in front of the cave. This cave is large enough to fit a large boat inside. The anchor will be invariably be in deep water, at least 35 metres, so do not go right to the bottom once you start your descent. Head over to the wall of the island, probably south-west from your anchor. Then head south over to the western side of the cave and follow this inside. Once inside you will see that this is a huge cave, at least 100 metres long. The bottom of the cave comes up from about 30 metres or so at the front in a gradual rise. There are quite a few medium sized bullrays swimming around in the cave. 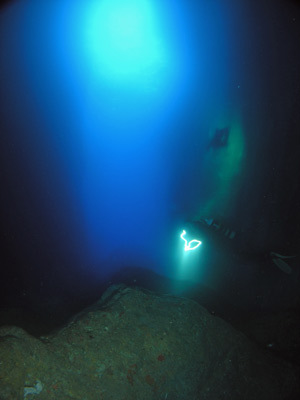 Even when you get to the end of the cave, the bottom is over 20 metres deep. There are lots of luderick at the end as well. The bottom consists of boulders and rocks. Once you reach the end, cross over to the eastern wall and follow this back out. You can get some nice silhouette photographs as you head along the walls of the cave. By the time you exit the cave you will have been down about 25 minutes at least. You should still have lots of air and bottom time, so head to the north and explore the wall. There are lots of two spot demoiselles here and the occasional kingfish and snapper. 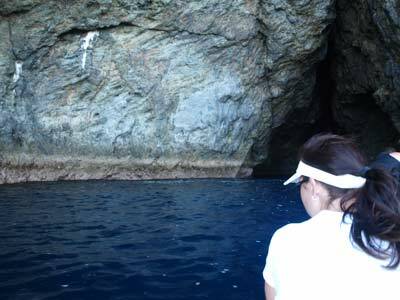 The depth outside the cave goes to well over 30 metres, but stay up in the 12 to 20 metre level. There is a lot to see. 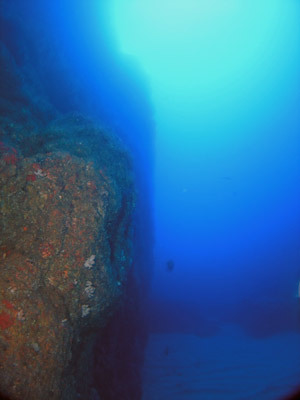 Gradually ascend and do your safety stop on the wall. 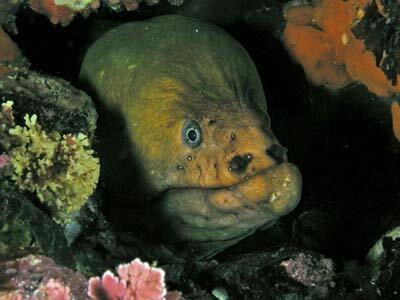 There are some eels in holes in this wall, including a very old one with a deformed mouth (see the photograph). 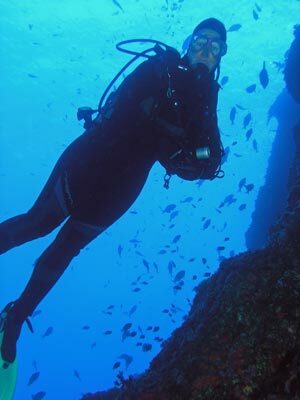 You can easily do a dive of over 50 minutes at this site. 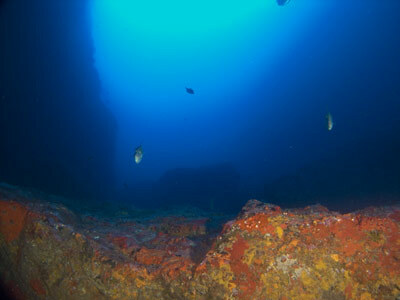 The visibility inside the cave is at least 40 metres and outside 30 metres. The water temperature was 22ºC in March and the seas millpond. A magical dive!